My mom does what she calls "survival cooking". She claims she's no great cook, but I don't remember not liking anything that she served us. Wait, scratch that, I didn't like her pork chops...dad's were always much better. But please, one thing of many meals she served us is all I have to complain about. She's a good cook. In fact, I think going to my parent's house is the ideal vacation because I don't have to cook. I get to enjoy having mommy serve me. It's especially nice to have that retreat now that I'm a mom. Anyway, if my mom is a survival cook, then I'm a few steps lower than that I'm probably a minimal cook. I've mastered a few of the basic meals: spaghetti, mac and cheese, skillet chicken cooked in various marinades because it's quicker than baking and doesn't involve me having to figure out how to start the charcoal grill, and a few select recipes that I've gotten off of kraftfoods.com. When I look at a new recipe it needs to have no more than 7 ingredients and take no longer than 45 minutes to make. Otherwise, it's not getting made in this house. I'm sure our meal calendars seem monotonous because my cooking abilities are so limited. But my dear husband is always a good sport. He's come to terms with my minimal kitchen abilities. For example, a few weeks ago we had some grape tomatoes that were about to go bad so I cut them up and put them on freezer garlic toast with some cheese and popped it in the oven for some semi-homemade bruschetta to go with our spaghetti for dinner. Chris was so impressed he talked about it for the rest of the evening. That's right, cutting up some tomatoes makes my husband think I'm a gourmet cook. Ha! So anyway, sometimes people tell me about some "fool proof" meals or I hear about something someone else did that sounds really good and I give it a try and then turn out disastrous. My friend Susan told me about the most delicious chicken dish her mom makes with just a can of cream of mushroom soup, some chicken, and dumping it in the crock pot. I tried doing just that. It didn't work so well for me. In fact, it was pretty nasty. Sunday, I was making a pork loin roast and I'd been saving some of Mike's delicious pepper jelly to use on it because I thought I remembered hearing Mike say something about how he used it on a pork roast before. So I get the roast all slathered up with the pepper jelly and put it in the oven with some peppers and onions and potatoes, and zucchini (the veggies turned out great). Then I turned to Chris and said, "I'm not sure this is going to turn out good." I'm use to marinading pork roast, not glazing it. And my dear sweet husband says for probably the millionth time in our marriage, "Eh, there's always ranch dressing." I looked over at the table where the Cricut is still sitting out from the last time I crafted. And said, I'm putting that over the kitchen door. 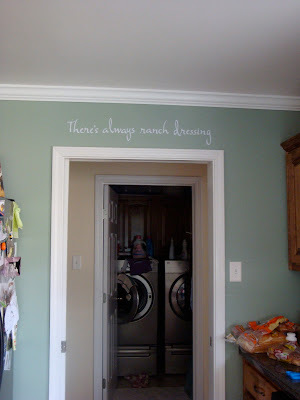 So today while Sarah was napping I used up the rest of the white vinyl I had laying around and put up my cooking motto above the door. I think it turned out pretty great! I feel like I've reached a new level in my stay-home-mom status. I've used a craft machine to cut vinyl and put in on my wall. Is there a check list that I get to mark off or a sticker I get for this? Cute vinyl! You get a gold star for that one! so cute! love the vinyl and love the post. p.s. give ourself some props, you are a good cook. You're still better in the kitchen then me. I told you about how i set the oven on fire trying to do mom's broiled chicken, didn't I?